Our parish Outreach programs serve the town of Waimanalo by running a Food Pantry for those in the community of all faiths who are in need. Saint George Parish Outreach is able to provide for our hungry and at-risk brothers and sisters thru generous donations from local organizations, businesses and churches, in addition to those parishioners, visitors and friends. These material and monetary offerings support the Pantry and Feed the Hungry Programs and make it possible to expand services to meet continually growing needs. Every donation, no matter the size, is greatly received. Our community of volunteers comes from local churches and organizations as well as St. George. Mahalo Ke Akua. Outreach hours are every Tuesday and Thursday from 9am to 12 noon (except holidays or when otherwise posted). Clients may visit Outreach for food assistance once per week. ﻿﻿﻿Our Outreach program also hosts a hot lunch program about four times a year. Meals are served from 11am - 1pm. The Feed the Hungry Program was created in the Year of Faith (2012-2013) as a means of connecting with our brothers and sisters whom we might not otherwise get to know. Sharing a hot meal and the fellowships of talking and laughing together provides a welcome break from difficult times. Learning about and from each other as individuals keeps us in touch with our humanity. 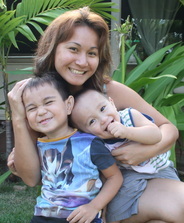 The mission of Family Promise of Hawai'i is to mobilize existing community resources to aid working homeless families with children and help them transition to permanent housing. On the first Thursday of each month, St. George Church distributes food brought to Waimanalo from the Hawaii Foodbank. Food is distributed in the church parking lot between the hours of 2:00pm-4:00pm. Families sign in and wait for their number to be called. Anyone can sign up and get food. NO DOGS ALLOWED ON THE PREMISES! On the following day after Foodbank distributions, anyone needing used clothing can go to St. George's Outreach coordinator, Blanche McMillan's home where clothing is distributed. Clothing give-away is held on Friday, Saturday and Sunday from 9:00am-4:00pm. The address is 41-902 Oluolu St., Waimanalo.